This mixed-use development on the east side of Yonge Street, adjacent to the Yonge Street subway, in the North York district of Toronto, was completed in 2001. 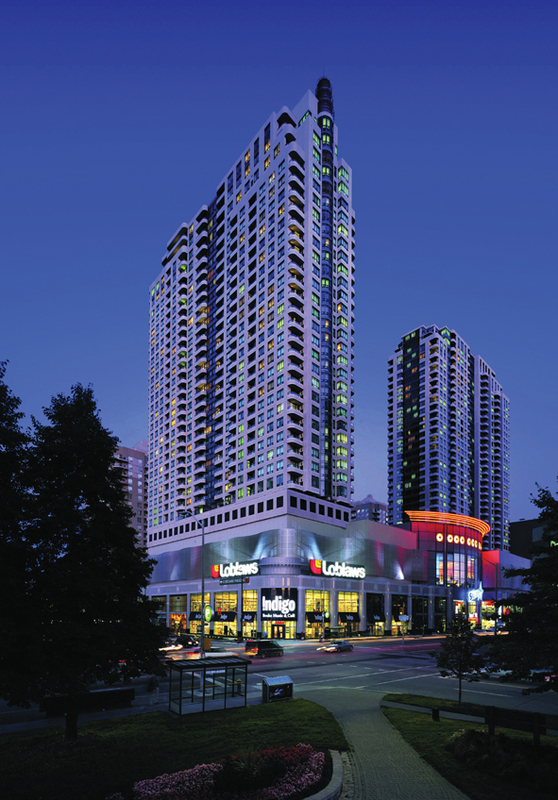 The project is comprised of two, thirty-two storey condominium towers, constructed above a four level mercantile podium structure containing a ten auditoria cinema on the top level, over three levels of shopping, with a Loblaw Super Store in the concourse level below, all over a five level subgrade parking garage. There is a direct connection to the North York City Centre subway station from the concourse level. The condominium suites are acoustically isolated from the auditoria of the cinema and the associated atrium space below. The central atrium, containing the longest spanning escalator in North America, is employed to present the surrounding space of the shopping levels and the cinema above same. It was imperative that, no shear walls or columns, from the condominium towers above, would penetrate through the auditoria of the cinemas. To satisfy this criteria, a one storey high (4.5 metre deep) transfer structure, consisting of 600mm wide beams, spanning the 19 metre width of the cinema’s auditoria, was designed to transfer the wind and seismic forces down through the walls of the cinema’s auditoria, in conjunction with the concrete walls at the perimeter of the cinema, thereby forming a compartmentalized “Box” which also provided lateral rigidity for the condominium towers above. Below the cinema level, the compartmentalized “Box” is supported on columns extending down through the retail levels and the five levels of subgrade parking, with another load transfer system being introduced, at grade level, to satisfy the special arrangement of the super store in the concourse below. Also, at the concourse level, there is another transfer system supporting all of the columns visible in the atrium. The column loads bearing the transfer structure at the concourse level are transferred to the columns in the five level parking garage below. To optimize the structural framing, and predict the structural behaviour of the transfer systems, the entire structural system was analysed employing a sophisticated “Finite Element” computer model. This analysis assisted in determining the locations of expansion joints, which were positioned to ensure proper structural behaviour and stability. To enhance the ability of the mass of the structural elements to eliminate the transmission of sounds and vibrations from the cinema, up into the residential levels above, the stadia seating structures in each of the cinema auditoria were isolated from the base building structure by acoustical absorbing bearing pads. This resulted in the stadia structures within each auditorium “floating” freely, with no direct concrete to concrete contact to the supporting base structure.